I am working on compiling a list of all the extant felt items I can find in historical order. 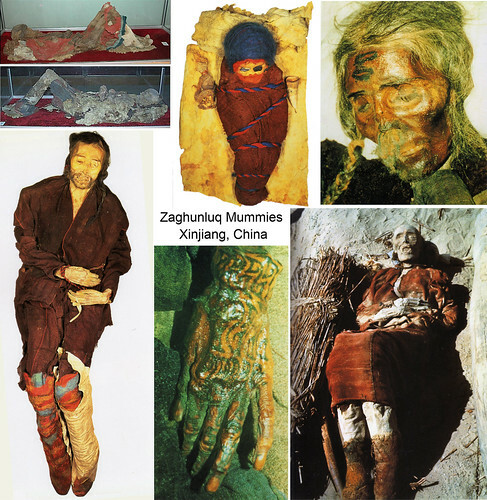 First the Tarim Mummies and related finds then I will move on to S. I. Rudenko’s “Frozen Tombs of Siberia” and work on the Sycthian finds followed by Aural Stein’s finds. This is a quick overview for historical reenactors in research for arts and sciences projects and as a simple jumping off point to help educate those unfamiliar with the long and amazing history of Felt. This doesn’t represent every single felt find and is meant to whet the appetite for deeper research into the subject and not as a comprehensive guide. The first reference I have found to felt comes from J.P. Mallory and Victor H. Mair’s book “The Tarim Mummies” and states that a felt rug dating to 2600 b.c. was found in Beycesultan in Anatolia on the floor of a shrine. The Catal Huyuk excavations were lead by James Mellaart from 1961 to 1965. Mellaart was a British archeologist researching the oldest evidence of a city. This was a Neolithic era trade city with evidence of both trade and religious activites. In the course of the excavations two evidences for a well developed use of felt were discovered. The first was a chamber with a mural painted onto the was which measured 6 x 4.5 meters (Johnson, p. 124) and which used curvilinear decorative details similiar to those still used in the region for felt carpets. The second evidence was found in the 1963 excavation in which pieces of fiber fragments believed to be animal in origin were found by an botanist work with the expedition by the name of Hans Helbaek. Catal Huyuk is believed to have had a thorough knowledge of the use of both woven and plant based fibers from as early as 6500 bc to 6300 bc. For an indepth discussion of Catal Huyuk and early fiber production Elizabeth Barber is a wonderful and informative author whose books carefully balance with necessary archeological facts with easy to follow explanations of the actually productions techniques believed to have been used for felting, weaving, and sewing. 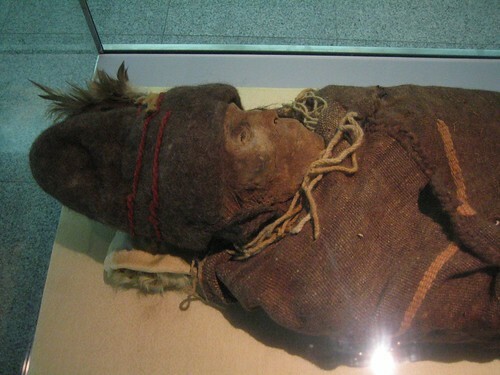 Prefelts—The stockings of the mummy Ur-David, also known as Charchan Man, from Ancient China—first mentioned on page 8. ” knee high socks of matted wool fibres (not quite felt) were as brightly colored as a rainbow- with horizontal stripes of flame red and golden yellow, but occasionally alternating with the most deliciously faint blue imaginable”. (Mallory and Mair, p.8-9) If you look closely at the bottom of the visible sock it appears to have felted and the customary pebbled surface can be seen up past the ankle but that could also be a trick of the light or a result somehow of the burial. By the top of the sock, however, the wool appears loose and not fully enmeshed as it would be with true felting so it’s definite that it has not been fulled. The blanket stitch borders of this hat stand out and are still used as an edging by modern embroiderers which is a wonderful testament to the cleverness and resourcfulness of these people. This baby was found in the grave with Ur-David and is assumed to have been in his family. The baby’s head is wrapped with a brilliant blue bonnet of wool felt which I’m still trying to determine whether it’s true felt or prefelt like the man’s leg wrappings. The “Beauty of Kroran” or “The Beauty of Loulan”, found in the Uyghur region along the Towan River had a foot of hair which was “rolled up within a distinctive headdress made of felt over a woven base and topped with two goose feathers”. This statement makes me anxious to learn more. Is the woven base a separate piece with a secondary piece made of felt over it or is it the earliest know example of “laminate felting” which is currently being taught in several variations throughout the modern felting world? How is the felt joined to the woven base or is it joined at all? Further into Mallory and Mair’s text (p. 212) a more complete description is given saying she “wore a woollen hood consisting of an underlay of two pieces of dark-brown woollen cloth covered by a weather-resistant felt overlay.” Is this two undercaps, a single cap of woollen fabric with a seam, or laminated felt? The answer to that question would tell us immediately whether or not laminate felting was used. Certainly the technology existest to lay out a layer of felt then a loosely woven piece of wool fabric then more wool to continue with the felting process. When taking a class from Mehmet Ghirgic and Theresa May-Obrian the “canvas” that we used was muslin fabric on one side with felt embedded into it on the otherside. We were able to use less wool and get a very sturdy yet supple result. The mummy dates circa 2000-1800 b.c. and has been made into a national icon and source of pride for the Uyghur people. http://uyghur.50megs.com/photo3.html —This link has a more complete photo. 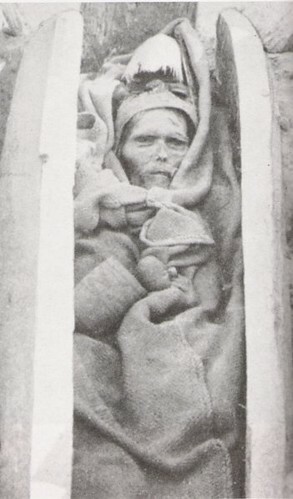 A similiar grave find of a woman from approximately the same time period of circa 1800 b.c. 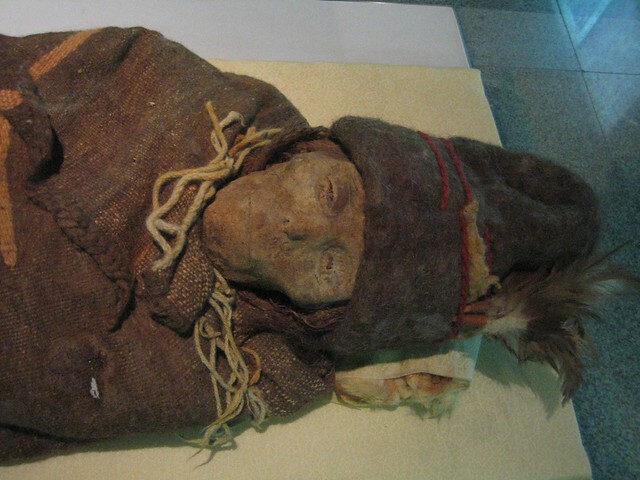 revealed a yellow felt hat decorated with red cords while the mummy of an old woman wore a cap of dark brown felt with an outer cap of yellow felt which was adorned with 2 feathers. In a cementary know as Ordek’s necropolis the grave of a young man yielded another felt hat which was of a similiar style and had 5 feathers in it for ornamentation. These hats had common elements of feathers, cord, and earflaps which could be tied under the chin and were found on both male and female mummies. The finds made in the Tarim Basin contained pieces of textiles made of felt, wool, silk, cotton, and even one pair of pants made from a repurposed tapestry thought to be imported from the West based off the style of weave and dyes used in it. (Mallory, Mair, p.155) The earliest finds contain the simplest textiles with complexities such as seams, dyeing, and ornamentation appearing as the centuries went by. The felt found in these graves included blankets, rugs, socks, hats, and dolls. Hi, thanks for your lovely descriptions! I’ve seen quite a few doco’s on these mummies in recent months (in Australia) and I hope you are successful in your felt explorations. These mummies are so fascinating! Thank you! I’m having fun researching it and looking forward to the summer when I can start concentrating again:>. I appreciate your feedback. This is a fascinating account of the historical felt finds. I’ve seen the Pazyryk finds at the Hermitage, but these examples (especially the mummified bodies) are stunning. Wild coincidence – I was just looking at Ur-David in a National Geographic last night! Amazing blog post and excellent research! Pingback: Celtic Mummies « ..: Ristorante Mystica :..
may I use your research in a paragraph I need for cultural influences on my felting? Please let me know. Thanks. Great stuff.